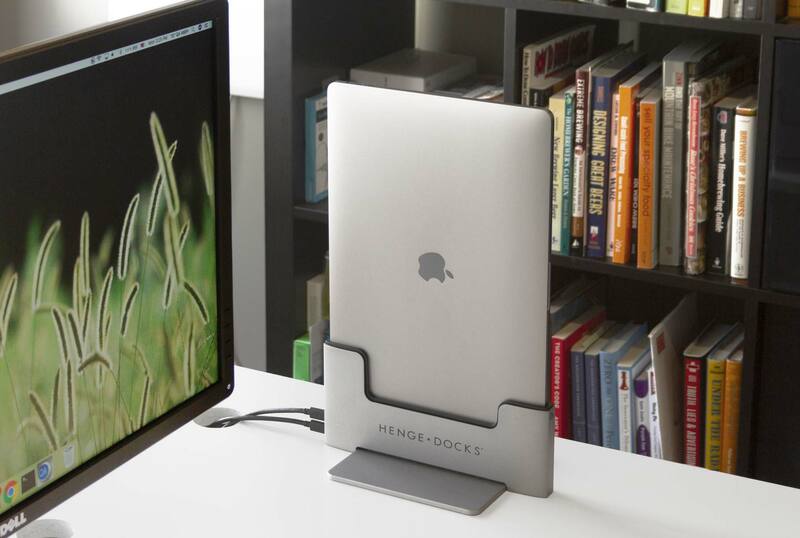 Sleek in its design and simple to use, the Vertical Dock opens up essential space on a crowded desk while neatly managing the flow of connections in and out of your MacBook. Once docked, your notebook blends perfectly with the solid metal chassis of the Vertical Dock, creating a more refined desktop experience. 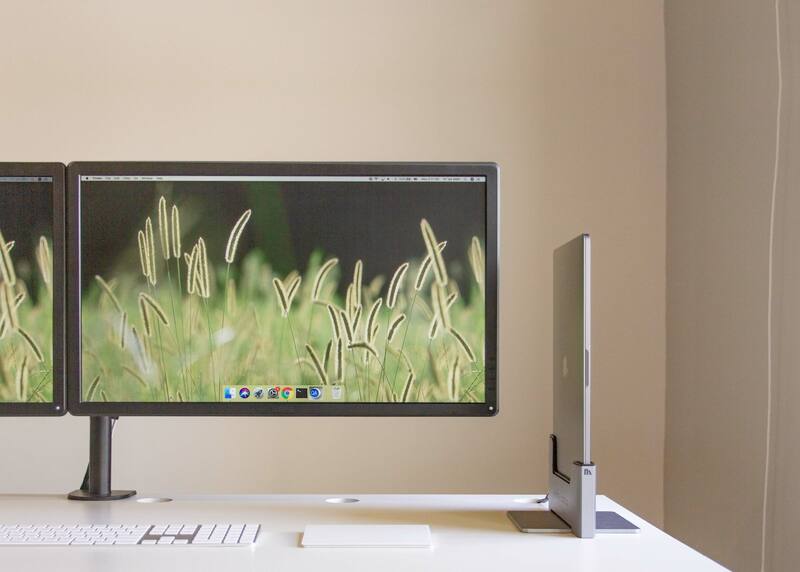 Simply slide your MacBook into the form-fitting Vertical Dock for a seamless integration and instant connection with all of your devices, including dual display capabilities. By decreasing the friction between you and your environment, the Vertical Dock gives you the freedom to focus on the critical tasks that deserve your full attention. As part of your desktop, home media center or conference room the Vertical Dock makes moving between those locations easier. The Vertical Dock works with any connections that work with your MacBook Pro making it at home in any environment. The new Vertical Dock’s precision alignment features make one-handed docking and undocking easy and consistent. A moving, suspended liner automatically aligns the connections to your MacBook during docking and assists in undocking. The optimized electrical design allows the Vertical Dock to pass the connections directly from your MacBook through two USB-C ports at a full 40Gbs. In other words, whatever you plug into your MacBook you can plug into the dock. 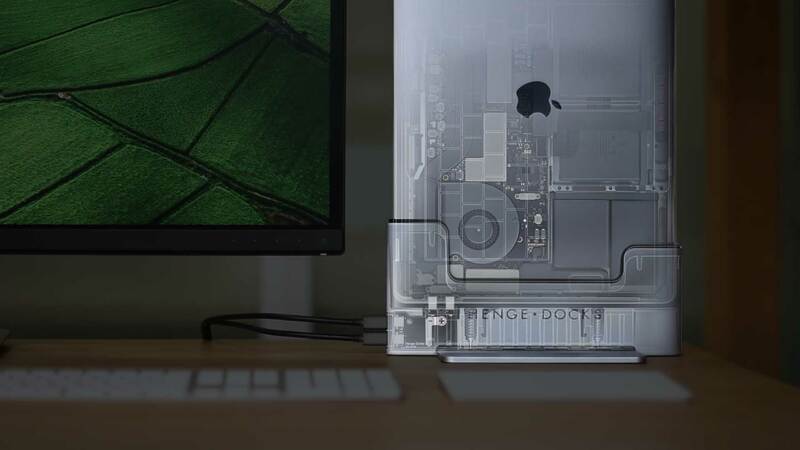 The Vertical Dock features intake and exhaust vents that move additional air to and from the MacBook’s cooling system. Efficient heat management keeps things cooler in clamshell mode even under the heaviest processing loads.